St. Bridget of Sweden was a Mystic and Saint, and founder of the Bridgettine Nuns and Monks after the death of her husband of twenty years. She is also the patron saint of Sweden and Europe. She was the daughter of the Knight, Birger Persson. Bridget’s mother was the daughter of the richest landowner of the country, and through her, Bridget was related to the Swedish Kings of her era. She married when she was fourteen, and bore eight children, four daughters – four sons. All of them survived infancy, which was very rare at that time. One of them was afterwards honored as St. Catherine of Sweden. Bridget’s saintly and charitable life soon made her known far and wide, and she gained too, great religious influence over her husband, with whom she went on pilgrimage to Santiago de Compostela. After their return, her husband passed away and she became a member of the Third Order of St. Francis and devoted herself wholly to a life of prayer and caring for the sick. She was inspired to develop the Religious Community called the Order of the Most Holy Saviour, or the Brigittines. The Principal house was in Vadstena and was richly endowed by the King and Queen. One distinctive feature of the houses of her Order was that there were “double” monasteries, with both men and women forming a joint community, though with separate cloisters. 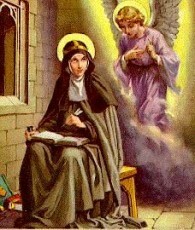 In 1350 she went to Rome, accompaied by her daughter, St. Catherine and a small party of Priests and Disciples. She wanted to obtain from the Pope the authorization of the New Order and partly in pursuance of her self-imposed mission to elevate the moral tone of the age. This was during the Great Schism period in the Roman Catholic Church. The Pope was out of Rome however, and was in France. It was not until 1370 however, that Pope Urban V confirmed the Rule of the Order. In the meantime, Bridget had made herself know in Rome by her kindess and good works. Besides going to Jerusalem on Pilgrimage, she remained in Rome until her death on July 23rd, 1373. Her remains were returned to Sweden. She was canonized in 1391 – eighteen years after her passing. St. Bridget had visions – as early as a child. They grew in frequency over the years, and her Confessor translated them into Latin. Her visions of the Nativity of Jesus had a great influence on depictions of the Nativity of Jesus in art. Shortly before she died, she described a vision which include the infant Jesus as laying on the ground, and emitting light himself, and describes the Virgin as blond-haired; many depictions followed this and reduced other light sources in the scene to emphasize this effect. Her visions of purgatory were very popular as well. Saint Bridget prayed for a long time to know how many blows Jesus Christ suffered during His terrible Passion. Rewarding her patience, one day He appeared to her and said, “I received 5480 blows upon My Body. If you wish to honor them in some way, recite fifteen Our Fathers and fifteen Hail Mary’s with the following Prayers, which I myself shall teach you, for an entire year. When the year is finished, you will have honored each of My Wounds”. The prayers became known as the Fifteen O’s, because in the original Latin, each prayer began with the words, O Jesus, O… The prayers were widely circulated in the late Middle Ages, and became regular features in devotional literature. They carried a promise that if said every day for a year, fifteen souls from the family of the person praying, would be released form purgatory, and fifteen family members living, would be saved. They can be found online or in the Pieta Prayer Book. St. Bridget was a humble, gentle, compassionate soul from a child until death. She lost her husband at an early age, and raised her eight children alone. She not only went on to serve the Church by founding an Order, she had a daughter that was canonized, St. Catherine of Sweden. She gave us the 15 – St. Bridget Prayers, that have had centuries of faithful praying them; many today still say them in the United States. So much can be learned by this dear Saints faith, and it is easy to love her because of the example she set for us.